Ideal as a pied-a-terre or long-term accommodation, Le Gleneagles will give you the ultimate in modern elegance. Fully-furnished with contemporary aesthetic, the sunny open-concept living space is large and inviting, complete with comfy faux fireplace, Smart TV, comfy couches, and a personal work desk. Prepare gourmet meals or entertain friends thanks to a linear kitchen fully-equipped with high-end appliances, cookware, and an eat-in 4-person dining table. The spacious queen-size bedroom offers maximum comfort and privacy, and features a wall-mounted television, as well as en-suite designer bathroom with walk-in rain shower. Unit #983 also includes unlimited high-speed Wi-Fi, free local calls, complete linens, and laundry closet for your added convenience. Simplissimmo makes living easy! Nestled in the lush greenery of Montreal’s Mount Royal, the historic Gleneagles was originally constructed in 1929, offering one of the most prestigious residential complexes in the city and a truly exceptional lifestyle. Enjoy exclusive access to well-equipped fitness room and a luxurious shared lounge with a beautiful view of the mountain. Residents also benefit from 24-hour concierge and valet service, with heated garage and free outdoor parking for visitors. 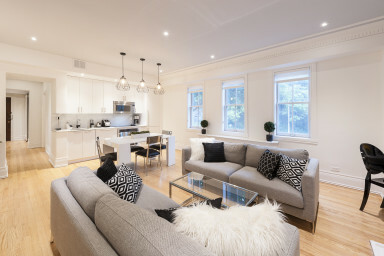 This particular address puts you in an area that offers the best of the city and nature, with close proximity to both the downtown core and Mount Royal. Those with an active lifestyle will love the mountain’s large network of hiking trails open year-round for climbing, biking and cross-country skiing, as well its scenic areas including the newly-re-designed Beaver Lake, the Camillien-Houde Lookout, and the Kondiaronk Belvedere. Heading down along Cote-des-Neiges toward the Golden Square Mile, is where you’ll find top cultural, shopping, and entertainment attractions, such as the Museum of Fine Arts for fascinating permanent and temporary exhibitions, or the near-endless designer store, boutique, and amusement centre options of St-Catherine Street, Montreal’s major commercial artery. When it’s time for diner, the always-lively Crescent Street offers great restaurants like Thursday’s, Weinstein & Gavino’s, and L’Atelier Argentine. Then stick around to experience some of the city’s infamous nightlife at places like the Sir Winston Churchill Pub complex, Hurley’s Irish Pub, and Brutopia, all within walking distance.